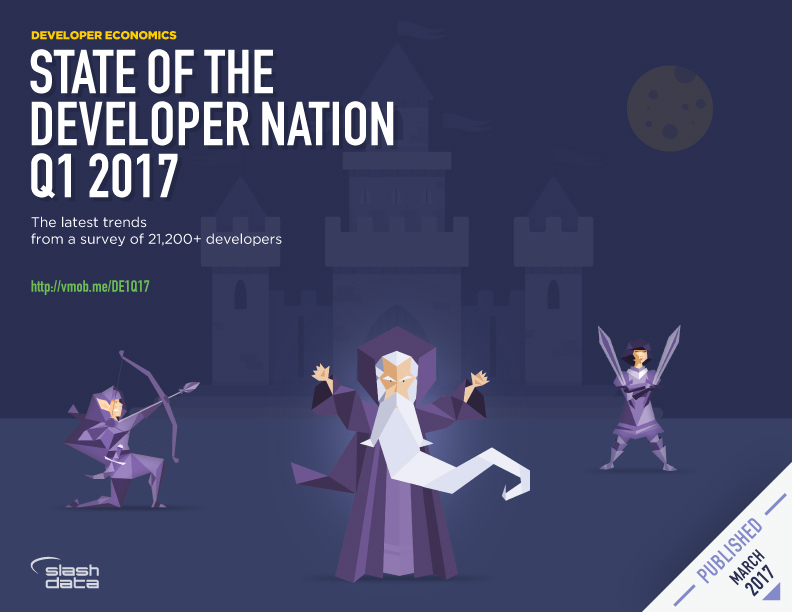 The State of the Developer Nation Q1 2017 report is based on the 12th edition of our Developer Economics survey. In it you will find insights generated from 21,200+ developers from 162 countries. Developer Economics covers mobile, desktop, cloud, IoT, and augmented and virtual reality, as well as data science and machine learning. The State of the Developer Nation Q1 2017 focuses on six major themes – each with its own visualization, showing how the data lends insight into the developer community. In augmented and virtual reality, a productive future seems further away than one might hope. Meanwhile, a look at the programming languages that AR/VR developers use reveals how technology vendors are jostling for position to capture this attractive market. Talking about technology battles: Amazon Web Services is now making so much money that they can’t spend their profits fast enough, while being in a price war with their public cloud competitors. We take a look at how they’re all faring. Over in the Internet of Things arena, the developer tooling industry has yet to find a stable footing: IoT ‘platforms’ are highly fragmented, underused, and by and large fail to connect developers with an addressable market. Data science forums are buzzing with the same question over and over again: what’s the best language for machine learning? Being data scientists ourselves, we couldn’t help but run a few models to see which are the most important factors that are correlated to language selection. Developer Economics 12th edition reached an impressive 21,200+ respondents from 162 countries around the world. As such, the Developer Economics series continues to be the most global independent research on mobile, desktop, IoT, cloud, AR/VR and machine learning developers and data scientists combined ever conducted. The report is based on a large-scale online developer survey designed, produced and carried out by VisionMobile over a period of six weeks between November and December 2016. The geographic reach of this survey is truly reflective of the global scale of the developer economy, including respondents from major app, machine learning and IoT development hotspots such as the US, China, India, Israel, UK and Russia and stretching all the way to Kenya, Brazil and Jordan. The online survey was translated into eight languages (Portuguese, Spanish, French, Russian, Korean, Japanese, Chinese (Simplified), Vietnamese) and promoted by 69 leading community and media partners within the software development industry. We continuously refine a sophisticated weighting methodology to remove as much bias as possible from our survey sample.